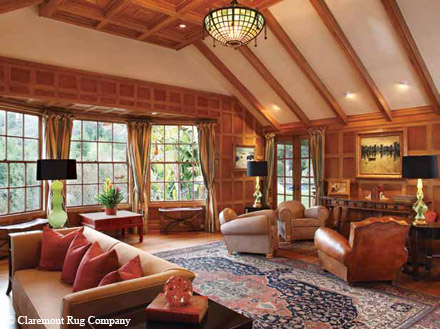 While echoing the grandeur of this finely crafted Great Room, this antique Ferahan Sarouk carpet creates a comfortable ambiance for intimate conversation and relaxation in the two seating areas. We humans have an innate impulse to surround ourselves with things that nourish our emotions, stimulate our imagination, add significance to our rituals, remind us of people or eras from the past, lend order to our worldview or simply add beauty to our everyday lives. It’s in our nature to collect things. Books from across the known world were assembled and lovingly housed in libraries when the Ptolemaic Dynasty ruled Egypt, if not before. Children at the seashore collect shells without prompting. Like many boys smitten with America’s national sport, I accumulated shoeboxes overflowing with baseball cards. My mother was so respectful of this childhood passion that she kept those boxes intact, in storage for decades. Throughout 33-plus years as president of a company dealing in art-level antique Oriental carpets, I’ve observed that my clients often become collectors unintentionally. They may begin with a practical purchase, with one piece acquired to fill a specific place in the home. Other times, collections begin emotionally: a particular piece resonates so strongly, so viscerally, that a client feels the need to have it. Finding a place to put it is a secondary consideration. The appeal of antique Oriental rugs, weavings made more than a century ago and more than half a world away, is complex. But put simply, they define the ambiance of one’s environment. And they can do so in many different ways. Some dedicated collectors bring an intellectual and historical perspective to their connoisseurship, honing an ability to recognize the rarest examples or “best-of-the-best.” Others focus on the juxtaposition of “opposites,” creating engaging interior aesthetics–a tribal rug displayed within a streamlined, minimalist, contemporary décor, or a finely woven floral piece used to anchor Impressionist or postmodern sculptures and paintings. Some fill every corner of their homes with expansive collections. Just as they might put display cases of Oceanic art or Chinese pottery in bathrooms and even kitchens (anywhere in her home that lacks art, one client observes, seems “emotionally devoid”), they take a creative approach to their antique rugs, placing them not only on their floors, but hanging them as wall art and draping them over banisters and furniture. Still others take a curatorial approach, keeping carefully catalogued troves of carpets in climate-controlled storage. Individual treasures are removed and displayed, perhaps seasonally. The pleasure of this rotating, personal exhibition is not unlike visiting with an old friend who has been absent for a long while. Absence makes the heart grow fonder and one appreciates how the friendship has grown in the interim. Many connoisseurs display their rugs as wall art, as well as on the floor. 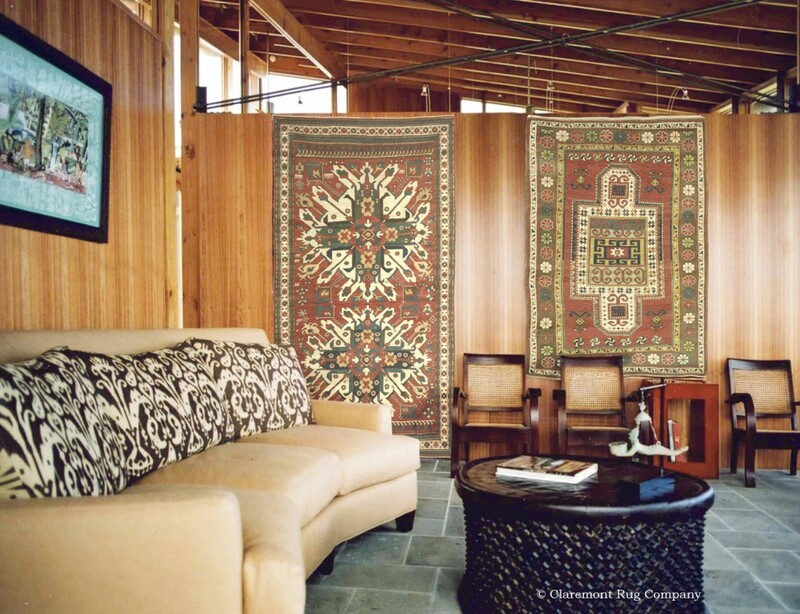 The pair of top-notch 19th century tribal rugs from the Caucasus Mountains on display in this collector’s cutting-edge island home are high-collectible antique carpets that that glow in this voluminous, naturally lit space. People who love beautiful objects often morph into collectors without quite knowing it, as they acquire more items than they can display at one time. When this happens, a few practical considerations are in order. A security system appropriate to the collection should be considered. Objects should be stored with consideration to their particular requirements for preservation. A museum storage facility is one feasible option. Written appraisals from an acknowledged expert in the field should be submitted to one’s insurance carrier and put in safekeeping. Images or videos of each item in the collection are a useful safeguard in case of damage or loss.